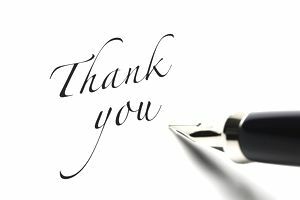 Are you wondering how to structure a gracious and winning thank-you note to send to a business associate or colleague? Here you will find several business thank-you letter examples, including thank-you letters for employees, managers, colleagues, clients, vendors, networking contacts, and other business professionals. Use these examples as a starting point for your own correspondence, being sure to edit them to fit your own professional and personal circumstances. A business thank-you letter can be sent as a written letter, a thank-you note, or via email. If you send an email message, the Subject Line should say "Thank You – Your Name" or "Thank You for Your Assistance – Your Name" so that the recipient knows why you are writing, at a glance. You can use this thank you letter example as a model to write a thoughtful note. Download the template (compatible with Google Docs and Word Online), or read the text version below. Thank you for your speedy and beautiful work fixing our floors after our plumbing mishap this spring. Although I would have preferred to meet you and your crew under different circumstances – a planned renovation, say, and not during our busiest season – I am so grateful that my neighbor recommended you. Our floors have never looked better. Customers comment on them at least once a week, which is unusual to say the least! I always make sure to give them your information and pass along my recommendation. Thank you, again, for fitting us in at the last minute and getting us back up and running so quickly. These examples are customized for different relationships in your business life. Business Thank You Letter Example: See how to format a simple business thank you letter to print and mail. Business Thank You Email Message Examples: Email can be a quick and easy way to thank someone who has provided you with professional assistance or excellent service. Business Thank You Letter for a Vendor: See how to send an email or letter to one of your suppliers or service providers who help make your business successful through their reliable delivery of the products and / or services you need. Appreciation Letter Sample: A letter of appreciation can be sent to someone who gives you a business contact or helps with your job search – it’s a great way of strengthening and maintaining your personal and professional relationship. Here's how to compose an appreciation letter for email or to print and send through snail mail. Sample Thank You Letter for a Colleague: If you want to thank a colleague for his or her help on a project or for support extended to you, use this example. Employee Thank You Letter Examples: Sending employees thank-you notes for work well done is both an effective and inexpensive way to boost workplace moral. Employees who are formally praised and thanked on a regular basis tend to take more ownership of their performance and display strong allegiance to their company. Show your employees appreciation for their service by writing a personalized letter or email, using these examples as your models. General Thank You Letter: A simple format for a thank you letter or email. You should modify this template to fit the situation and the recipient. If you are looking for a job, be sure to always thank those who have provided contacts and assistance. Not only is this an instance to show good manners – it’s also a politic way of laying a solid groundwork for a continuing, mutually beneficial networking resource. Sample Thank You Letter for Job Search Help: Use this thank you letter to send to someone who has helped you in your job search, such as a former instructor, human resources professional, or supervisor. Sample Thank You Letter for Networking: This note is directed to a person you met through networking, either face-to-face at conferences or job fairs or through professional social media sites like LinkedIn. Thank them for helping you develop contacts and further your career goals. Sample Thank You Letter for a Referral: Sometimes the most effective way to land a dream job is to be referred by someone who either already works at the organization you’re interested in or is on good terms with its management. Here’s how to thank someone who has given you a referral to help with your job search. Sample Thank You Letter to Accept a Job Offer: Use this format to thank an employer for the offer and make a written acceptance. Thank You Letter to Decline a Job Offer: How to be gracious should you decide to bow out after a hiring committee makes you a job offer. Sample Thank You Letters for Job Interviews: Follow-up the interview with a thank you email or letter. Here are examples for the first interview, follow-ups, second interview, group interview, and other variations.